Let's be perfectly clear: The Hamilton Beach Breakfast Sandwich Maker ($29.99) is not a gourmet, high-tech, fancy cooking tool for super-serious cooks. What it is, though, is fun. And it's well-built and sturdy, considering what it's designed to do. And it works just like it's supposed to. The whole idea is to make a breakfast sandwich like the ones from fast-food restaurants. You could certainly do that with normal cooking equipment - a toaster, frying pans, egg rings - but that's really not the point. This gadget makes the process a little more user-friendly. Or maybe I should say kid-friendly. Or cooking-challenged friendly. Because this isn't really like cooking. It's a simple assembly process that just about anyone could manage. The idea is that you start with the bottom of a muffin, add meat, cheese or vegetables on top, then close that section and put an egg on the next layer and put the top piece of bread on top of the egg. Close it up, and in about five minutes, the egg is cooked, the bread is toasted, and everything is very hot. Slide the bottom out from under the egg, and there's a complete sandwich. Letting kids make their own fast-food-style breakfast sandwiches might help picky kids get involved with cooking - which is supposed to help them become more adventurous - and mom could limit the selections to healthier choices. 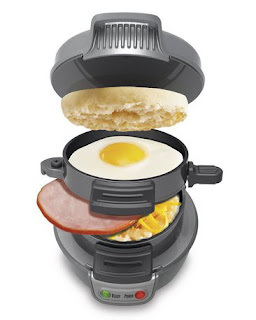 Younger kids would still need supervision, because this machine does get hot while it's cooking, but they could choose their ingredients and make their own special breakfast sandwiches with a little help. Older kids could work unsupervised, making breakfast or an after-school snack. Kids with allergy issues who can't have fast-food style sandwiches might also get a kick out of making their own sandwich that looks like the real thing. And since this is small, it's something that could be brought along on trips to make a safe breakfast in a hotel room or in someone's home. Or an adult with allergy issues that prevents them from using the communal toaster and microwave might keep something like this in their office. Since it takes about five minutes for an egg to cook in the sandwich, this isn't the best bet for someone who needs to make a half-dozen breakfast sandwiches. In that case, you might as well break out the frying pan and egg rings. But for someone single, a breakfast sandwich could be done in the time it takes to brew coffee. 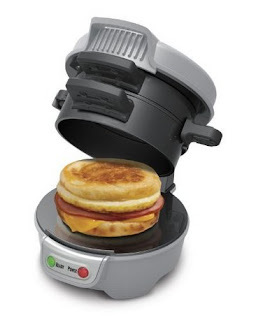 Besides breakfast sandwiches, I've used this to make English muffin pizzas and hot ham-and-cheese sandwiches on biscuits, so it's not all about breakfast. Is this for everyone? Absolutely not. Is it for some people? Definitely yes.